The day isn’t even half over and I am bringing you yet another SEMA 2012 preview of yet another Scion FR-S. This one comes to us from our friend Jay at JDMEGO. He designed and rendered the Rocket Bunny widebody equipped Scion FR-S you see before you for Mark Arcenal’s fatlace brand. 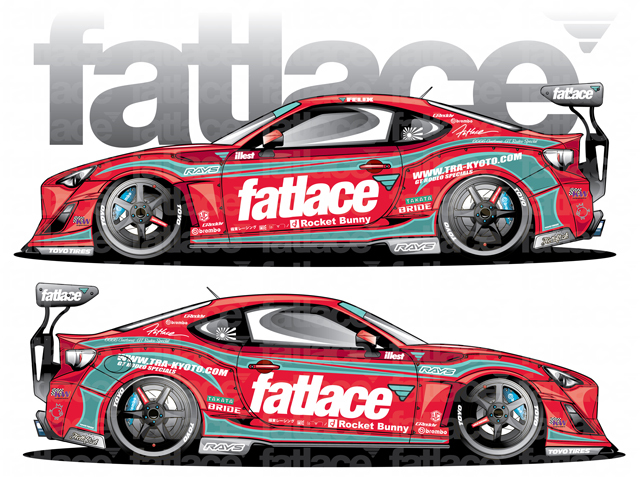 Much like their BenSopra GT-R, the fatlace/Rocket Bunny Scion FR-S has a defintie time attack theme going on. Once glance and this thing and you automatically think “race car”. Beyond this rendering details on this car are slim but we can figure out a few things going by the “decals” on the rendering. Besides the obvious Rocket Bunny widebody kit, Toyo Tires, and Volk TE37 SL wheels, it appears that the Fatlace FR-S will also sport a KW suspension system, Brembo brakes, Takata harnesses, and BRIDE seats on the inside. What is a real mystery are the engine performance adders. There is a GReddy decal on the rendering but I am not sure if that means there is merely a GReddy exhaust in the works or if there will be a full suite of GReddy performance parts under the hood. It looks like we will just have to wait until SEMA to find out. If you will be at SEMA this year, you can get an up close look at this car in the Scion booth. For now, click the thumbnail below for a 1920 pixel width size picture of the rendering for your viewing pleasure.